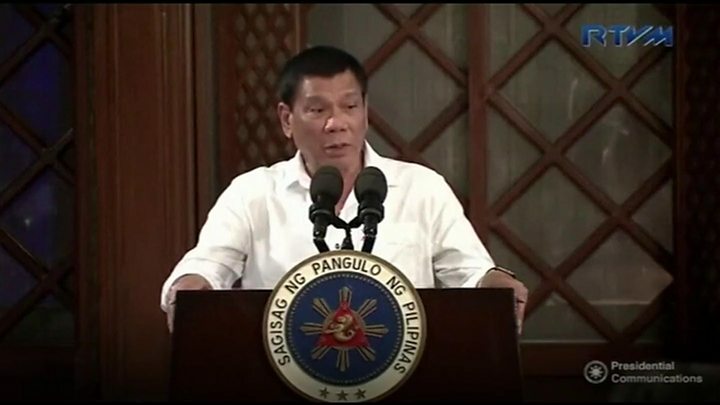 Media captionPhilippines' President Rodrigo Duterte: "I was looking for an encounter so I could kill"
Philippines' President Rodrigo Duterte has admitted he personally killed criminal suspects as mayor of Davao. It is the first such admission he has made since becoming president in June, but echoes comments he made in 2015. "The climate of impunity in the Philippines has intensified even further since President Duterte began his brutal crackdown on suspected drug users and dealers in July, with a wave of unlawful killings claiming more than 5,000 lives across the country," said Rafendi Djamin, the group's director for South East Asia and the Pacific. "By boasting about the blood on his own hands, President Duterte will further embolden police and vigilantes to blatantly violate laws and carry out more extrajudicial executions without fear of being held to account." But just hours before Mr Duterte's latest remarks, he insisted "I am not a killer", in a speech for The Outstanding Filipino Awards 2016. He has also previously both acknowledged and denied being involved with death squads. In September a Senate inquiry heard testimony from a self-confessed former death squad member that Mr Duterte had, while serving as Davao mayor, shot dead a justice department agent with an Uzi submachine gun. Nearly 6,000 people are said to have been killed by police, vigilantes and mercenaries since Mr Duterte launched his drug war after being elected in May. He has expressed few regrets about the policy, once saying: "Hitler massacred three million Jews... There's three million drug addicts. I'd be happy to slaughter them." Mr Duterte has repeatedly said he does not care about human rights and has suggested that lawyers defending drug suspects might also be targeted in his campaign, says the BBC's Jonathan Head. Some human rights lawyers believe the outspoken president's open support for a shoot-to-kill policy by the police could make him vulnerable to prosecution for crimes against humanity at the international court.